The Green & White Teas we carry in the store have a history dating back to 2006. At that time we carried several Green Flavoured teas but noticed that customers purchased them once, but seldom came back for more. We did an analysis of the green flavoured teas we sold at that time and they were based on the Japanese green Sencha tea. These Sencha teas need to be steeped for a particular steeping time and temperature or the taste will not be optimum. Knowing that some Chinese teas are more forgiving for steeping times and temperature, we experimented and found them much better but they still needed some improvement. Further experimentation found the addition of White tea to the blend would help the steeping time and temperature hold up better for those ‘mistakes’ we all make when steeping a cup of tea - water too hot, steeping time to long, too much tea etc. Success! Our flavoured Green & White tea sales grew and we had satisfied customers. We made them with better quality ingredients and more appealing to the eye as well. At that time suppliers did not offer much in the way of flavoured green teas except those blended with the Japanese Sencha and they looked ‘blah’ for the most part. We have noticed in the last approximately 6 years that more suppliers are now making improvements to their Green flavoured blends. Our line up of Green & White Teas include blends such as: Green & White Unflavoured, Pear Cream, Mango, Lemon, Vanilla, Grapefruit, Earl grey, Chai, Caramel, Heavenly blend, Ginseng Supreme and a very popular Ginger Lemon. For steeping we suggest a temperature of 180F and a steeping time of about one to one & one-half minutes for the most pleasant taste (for those of us who like ‘mellow’). For a little stronger taste we suggest steeping for about 2 minutes. You may get up to 3 infusions of the same leaves. 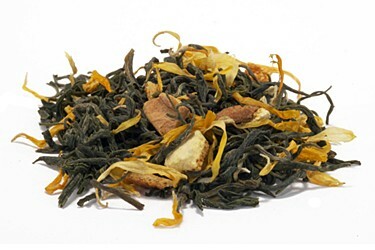 Each time you infuse increase the steeping time slightly. These delightful teas are available at our stores or you can shop online.